This size silicone wire is great for your high powered S-300 (up to 9 amps) and smaller. High quality, supple and many fine strands. 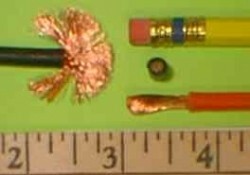 Wire consists of 90 strands of 0.08mm wire (008x90). Gauge is 20. OD of silicone jacket is approximately 1.5mm. Cross section area = 0.33mm sq. Comes in package with 1 meter of each of both red and black. Cut in bulk by the foot, the more you buy the more you save! This size silicone wire is great for your high powered S-400 (14 amps)and smaller. High quality, supple with many fine strands. Wire consists of 3 bundles of 50 strands of 0.08mm wire(008x50x3). Thats 150 Strands. Gauge is approximately 18~19. OD of silicone jacket is approximately 2.4mm. Cross section area = 0.75mm sq. This size silicone wire is great for your high powered S-480, cobalt 400, Astro 020 or similar(20 amps)and smaller. High quality, supple with many fine strands. Wire consists of 7 bundles of 30 strands of .008mm wire. That is 210 Strands. Gauge is 17. OD of silicone jacket is approximately 3mm. Cross section area = 1.06mm sq. 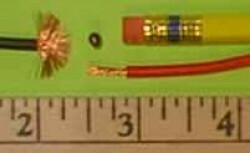 This size silicone wire is great for typical Sub C battery type applications. Generally up to 35 amps and smaller. High quality, supple and with many fine strands. Wire consists of 7 bundles of 57 strands of 0.08mm wire = 399 strands (008x57x7), gauge is approximately 14. OD of silicone jacket is approximately 4mm. Cross section area = 2.0mm sq. Comes in package with 1 meter of each red and black. Wire for your high power applications. 50 amps is no problem here. High quality, supple with many fine strands. 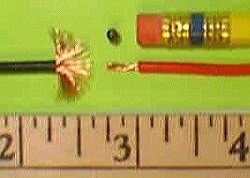 Wire consists of 7 bundles of 70 strands of 0.08mm wire (008x70x7) = 490 strands, gauge is approximately 13. OD of silicon jacket is approximately 5mm. Cross section area = 2.46mm sq. Wire for your Extreme high power applications. 100 amps is no problem here. High quality, supple with many fine strands. Wire consists of 7 bundles of 113 strands of 0.08mm wire (008x113x7). Thats 791 Strands. Gauge is 11. OD of silicone jacket is approximately 5mm. Cross section area = 3.97mm sq. Comes in package with 1 meter of each red and black. Note, new supply from factory came in as BLUE & YELLOW, understand your shipment may be in BLUE & YELLOW. 10 gauge wire for your Extreme high power applications. Over 100 amps is no problem here. High quality, supple with many fine strands. Wire consists of 1020 strands of 0.08mm wire. Gauge is 10. OD of silicone jacket is approximately 5.4mm. 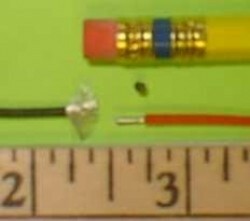 6 gauge wire for your Extreme high power applications. Over 200 amps is no problem here. High quality, supple with many fine strands. Wire consists of 3200 strands of 0.08mm wire. Gauge is 10. OD of silicone jacket is approximately 8.3mm.